Boston have expanded their Hyper Space North American tour with the addition of 21 concert dates across the continent. 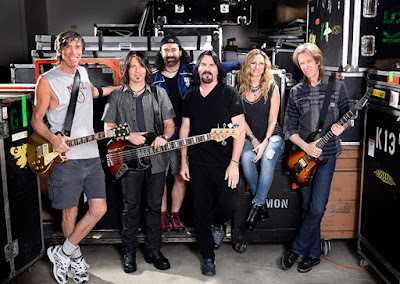 Following a previously-revealed opening run of ten shows in April, the band have added a second leg starting June 14 in Mountain View, CA and announced that Joan Jett & The Blackhearts will be along as special guests. One dollar from each ticket purchased this summer will be donated to Sea Shepherd Conservation Society, who are committed to ending the slaughter of wildlife in the world’s oceans, as well as Mercy For Animals, who utilize a broad range of strategic approaches that seek to expose cruelty, prosecute abusers, and inspire consumers to make compassionate food choices. "I am thrilled to have Joan and her band on tour with us this summer,” says Boston leader and guitarist Tom Sholz. “Not only is she an amazing rock and roll performing artist, but even more exciting to me is that she is a fellow vegetarian and shares compassion for animal welfare." Presale tickets for Boston and Joan Jett & The Blackhearts fan club members begins March 7 at 10am local time and runs through March 9 at 10pm local time. General public seats will go on sale March 10 at LiveNation.com and on the Live Nation app. Boston’s 2017 touring lineup includes Scholz, vocalist Tommy DeCarlo, guitarist Gary Pihl, keyboardist Beth Cohen, bassist Tracy Ferrie, drummer Jeff Neal and backing vocalist Curly Smith. Four dozen concerts are planned, with more dates to be revealed soon. Last year, Boston toured the continent to mark the 40th anniversary of their self-titled debut album.